Here's my card for the current sketch at Freshly Made Sketches. This design came together super quick using the Watt's Up? stamp set from SugarPea Designs. I stamped two of the set's light bulb images on a narrow white panel, using a fine tip pen to extend the images to the top of the panel. The bulbs were colored with Copic markers. I was going for a glow-like look for the bulbs, so I lightly shaded the bulbs with pale blue, then outlined the images in yeullow. The bulbs were coated with a light layer of clear glitter from a glitter pen for added sparkle and shine. After matting the image panel on yellow cardstock, I adhered it to a gray card base. The set's "you brighten my day" sentiment was stamped on a narrow strip of cardstock and matted on yellow cardstock. 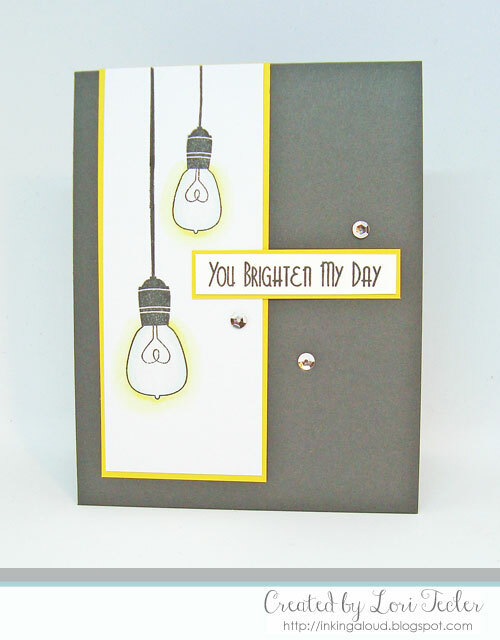 I added it to the cardfront and accented it with a trio of sparkly silver sequins. Love it! I always love a matching sentiment and image combo - this one makes me smile. Thanks for joining us at FMS this week!